Technology has revolutionized the search for oil, giving us the ability to determine more precisely where potential new oil fields are located with minimal impact to the environment. This technology includes 3-D seismic surveying. 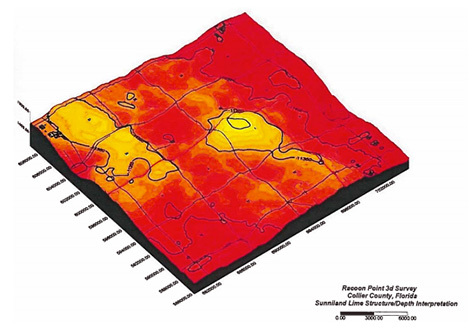 3-D seismic surveying significantly reduces the impact to the environment, as it eliminates the need to drill multiple exploratory wells and allows Collier Resources Company’s (CRC) lessees to be more strategic about the placement of development wells. 3-D seismic surveying uses sound waves to locate oil formations at great depths, much like an MRI produces a map of the human body. If exploration with a 3-D seismic survey reveals potential underground oil formations, the lessee will begin the permitting process to drill. The permitting process can take a year or more to complete and includes a rigorous review of plans by several federal, state and local regulatory agencies, which can include the National Park Service, the U.S. Fish and Wildlife Service, the Army Corps of Engineers and the Florida Department of Environmental Protection and the South Florida Water Management District. This then begins a comprehensive preparation process that incorporates a variety of measures to protect the environment and Florida’s natural resources. Once complete, drilling and production commences using the latest and most advanced technologies to minimize environmental impacts. Burnett Oil Co., Inc. (Burnett Oil) has applied for a permit to conduct 3-D seismic surveying in the Big Cypress National Preserve. Once the permit is approved, Burnett Oil will utilize an OYO GSR Wireless Recording System. This system uses a bundled recording system that includes a battery and recording box. Geophones attach to the recording box at the location. Geophones are the listening device for the acoustic sound wave. Since geophysical surveys are based on echo technology, technicians listen for the returning sound wave that is reflected off the rocks below. These geophones are so sensitive they can detect raindrops hitting them. 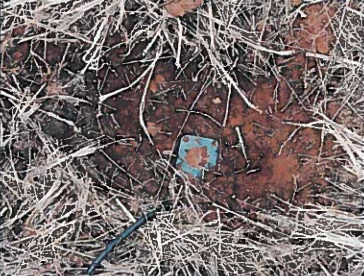 Geophones consist of a plastic case and spike that anchors the case to the ground where it remains in this location until retrieved by a crewmember. 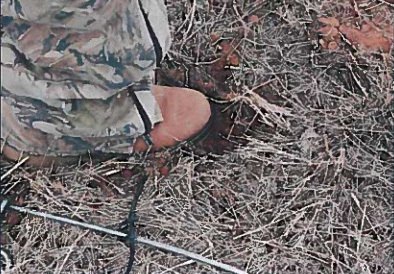 Geophones are "planted" into the ground by stepping on them. What a typical geophone "plant" might look like. A group or array of 6 geophones at a location. This is an autonomous continuous recording system that utilizes GPS for positioning, is light weight and leaves a very small footprint on the ground and no cables. Currently, there is also a permit pending to conduct 3-D seismic surveying in the Big Cypress National Preserve (BCNP) utilizing vibroseis machines. Recently, comments have been made that the vibroseis machines, sometimes used in the 3-D seismic surveying process, could potentially crack or fracture the karst limestone leading to changes in the perched hydrology and impacting wetland hydroperiods in the Big Cypress National Preserve (BCNP). However, because the vibroseis seismic surveying technique is not intrusive, beyond temporarily affecting near-surface features and soils, it will not adversely affect the associated hydrology and flow system of the BCNP. To better understand the karst topography in the BCNP, CRC invites you to download our one-pager on the Surficial Geology of the Big Cypress National Preserve by clicking here. In addition, present day satellite imagery shows no detectable impacts in the Big Cypress National Preserve from over 474 miles of 2-D seismic, acquired over several decades, and one 3-D seismic survey acquired in 2000 at Raccoon Point. Further, all proposed seismic activities are designed to preserve existing trees and vegetation, plant root systems and soil. 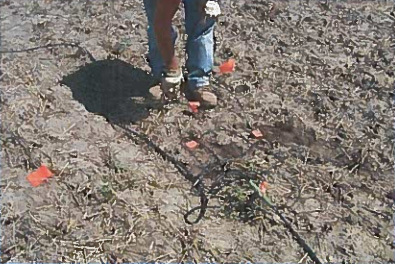 The surveys are also designed to avoid using flagging or stakes, as well as potential impacts to wildlife and cultural resources. There will also be a state-approved biologist and archaeologist on site at all time to instruct crew to avoid disturbing wildlife and cultural sites. 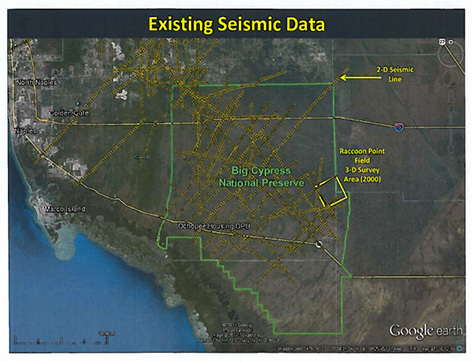 Finally, no seismic operations have, or will, occur within Everglades National Park.